I am, for some reason, very tired today… I guess I am not a young spring chicken anymore. So, I won’t blah-blah much. 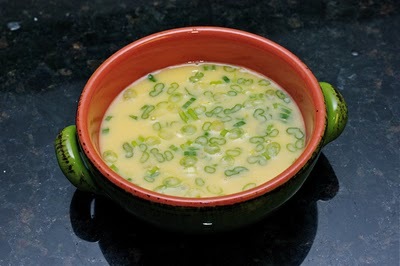 Here is very simple side dish or main depends on the degree of your hungriness. 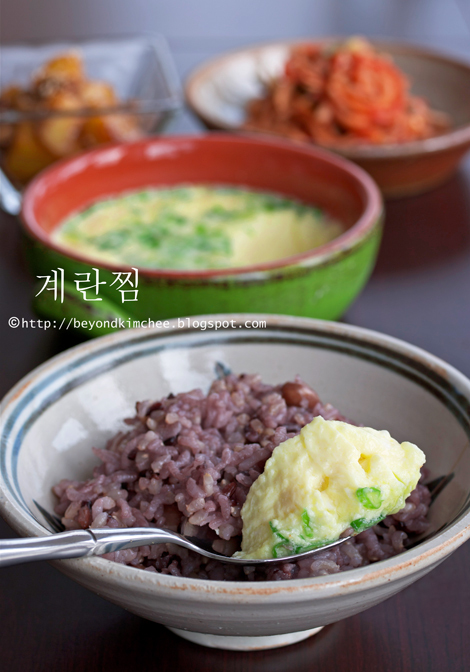 It is super quick, easy to make egg dish. 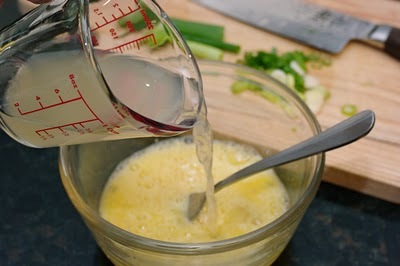 This is, perhaps, one of the softest and silkiest way of enjoying the eggs, but faaaaaaaar easier than French souffle. 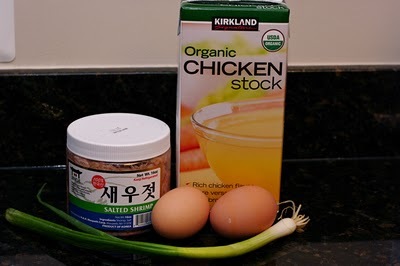 All you need is; Two happy eggs, some wicked salted shrimps (or salt), egg’s mommy stock, and a lonely skinny green onion. Beat eggs and add chicken stock. This is an optional step and I usually skip this. 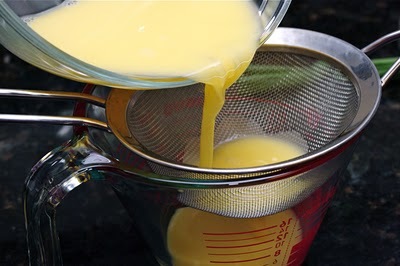 Straining through the mesh removes the lumps of egg white, which creates silkier texture. If these baby shrimps gross you out, use salt instead. Chop up these wicked guys very fine and add to the beaten eggs. Put water in a pot that can reach to half way to the steaming bowl. Place a small plate on the bottom. It will help to stabilize the bowl when the water boils rapidly. 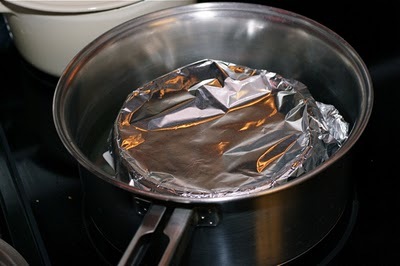 Cover the bowl with foil and cover the pot with lid again. Boil for 6-8 minutes or until a knife inserted in the center comes out clean. Eat carefully. It is HOT! Suddenly a century old question came to my mind. A chicken or an egg? Combine all the ingredients in a steam proof bowl. Cover the bowl with foil. 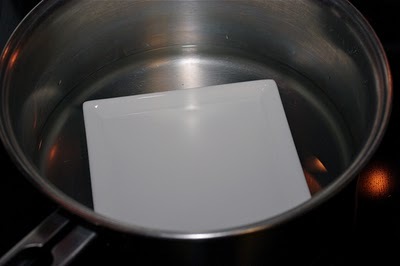 In a pot filled with water that can reach to the half way up to the steam proof bowl in it, place a small plate on the bottom of the pot to secure the bowl during boiling. Place the bowl and cover the pot with a lid. Boil over medium high heat for 6-8 minutes or until a knife inserted in the center comes out clean. Be cautious! It is very hot. Serve hot or warm with a bowl of rice. I hope you are doing well with your family. *A big thumbs up* for all the dishes we have tried on your blog so far! 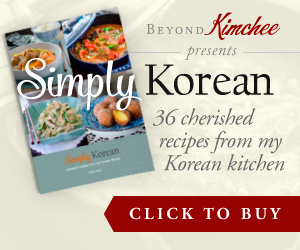 will be trying more especially once we go korea and stock up for my kitchen! Thanks, Lucy. I am glad that it turned out good for you. Stock up lots of stuff from Korea. 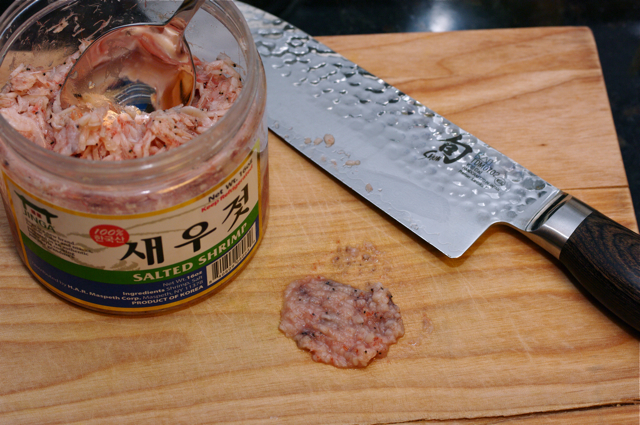 I would recommend Korean chili flakes, dried Korean anchovies, dried seaweed for roasting, and home-made doenjang if you can handle. These are the stuff I usually get when I go to Korea. Thanks Holly, I already had in mind to buy the anchovies and kelp. I will most likely also get the others recommended. I recently tried fresh roasted seaweed from Korea, my bf's uncle's gf is korean and her family own a seaweed factory - it's so good with rice! 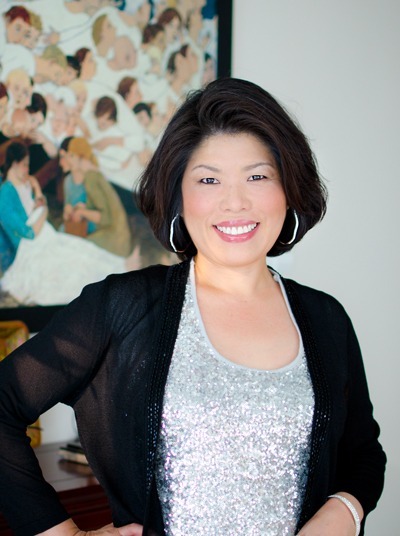 Hi Jessica, I am so glad to hear that it turned out so well for you. Sometimes, creating a good dish is not just coming from a good recipe, it is about knowing good tectonics and know-hows to make it better. Simple tips help things go much smoother in cooking. This particular egg pudding recipe is very simple side dish to try first. Also Try easy Korean beef recipe in my site. You can find it under recipes tab on my menu bar on top. This is my fave side dish! Whenever we go to our favorite korean bbq place, we always get a side order of the steamed egg. I have tried making this before, but could not get the taste right. Thank you! Looks delicious and easy enough!! What type of bowl do you recommend to use and how would you do it so that clean up is easy? 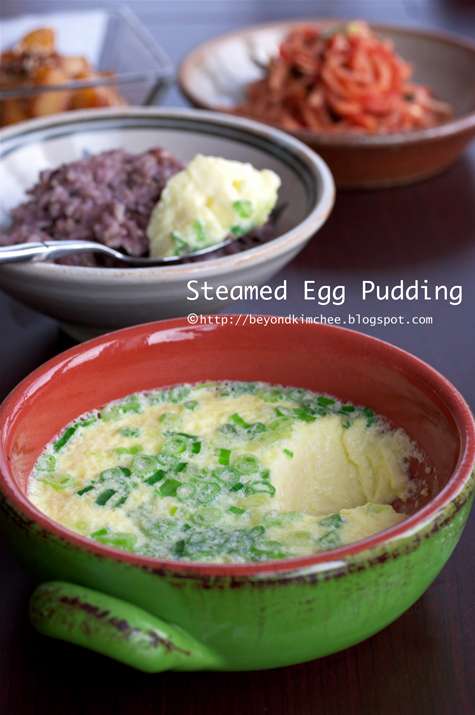 I use a glass bowl and the egg pudding after cooking left a permanent stain on the bowl!! Thanks!